Small round design consisting of desert roses and lovely green leaves. Flowers are stitched with 3 different colors of DMC Color Variations on a new PTP 28ct Cashel Linen called Petals. Fabric: Stitched on 28ct “Petals” Cashel Linen by Picture This Plus. 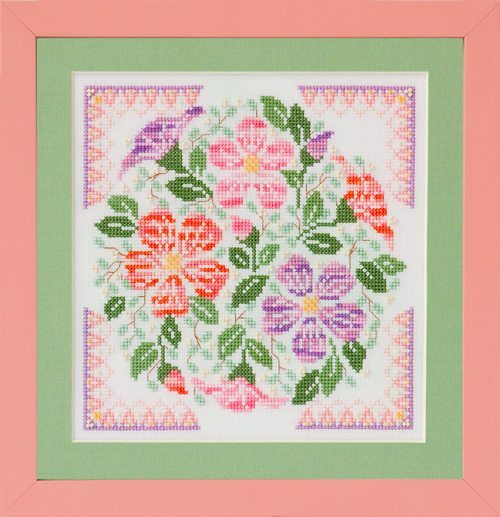 Design Area: 7″w X 7″h. Fibers: Uses a total of 8 colors of Sullivans floss and 3 colors of DMC variegated floss. DMC and Anchor comparable colors are also provided. Other materials: Also requires 2 colors of Mill Hill Beads.